Picking a fifth wheel trailer worth your value will without a doubt be a time-consuming task. Hopefully, by knowing the basics to look out for in these types of trailers will half your workload. What Are Fifth Wheel Trailers? Fifth wheelers are the most popular among all towable RVs. This is mainly due to their hitches which are sturdy and suitably located. Usually mounted right over the tow truck’s rear wheels, the hitch ensures more stability and relatively lower center of gravity. As such, these trailers have been used for many decades to haul heavy loads. They come in lengths ranging from 21 to 40 feet with 32 to 36 feet options being the most popular ones. Slideouts, as many as four, are also included in most fifth wheelers for additional bedroom and living spaces. A fifth wheeler can set you back $15,000 to $160,000, without a tow truck, depending on its length and included amenities and features. Kitchen; solid surface countertops, 2-4 burner cooktop and oven, dinettes, microwave and hardwood cabinetry. Sitting room; large flat screen TVs on swivel stands to allow multiple viewing angles, DVD player, leather recliners and sound systems. Full-size appliances; washer/dryer set, refrigerator. Electric fireplace, high BTU furnace. Full glass-door shower stalls with skylights. Large picture rear window for breath-taking panoramic views and Frameless windows for a clean look. Electric adjustable awning with lighting. A fifth wheel typically sleeps in four to eight people but can also accommodate more given its large space. You can use an air mattress, folding sofas and dinettes for additional sleeping space. The master bedroom is located in the front part of the trailer, in essence, the area overhanging the truck bed. Ideally, you want a fifth wheel trailer with a foundation that is durable and can support additional weight. Frames that use steel I-beams tend to be sturdier than other building styles. The frame doesn’t offer too much flex that might interfere with the fifth wheel’s mechanical, plumbing and electrical systems. C-channel steel frames may be a worthy option to consider. However, avoid going for fifth wheelers with Tubular aluminum or Stamped steel frames as they don’t offer the required support needed for these type of trailer. It comprises of the outer-layer, protective layer, insulation layer and the décor layer. Fiberglass is the standard material of choice for the outer layer, while Azdel and plywood may be used in the underlying layer. Always go for trailers with Azdel composite panels since they are odorless, lighter than wood, waterproof, mold- and rot-resistant. They are a bit costlier as compared to Luan plywood but offer better insulation and sound-proofing features than the latter. Delamination, the act of separating or splitting a laminate into layers, is a common problem with plywood walls and can be very expensive to repair. For instance, fiberglass/gel coat outer layer may separate from underneath Luan plywood layer. Styrofoam and fiberglass are the main types when it comes to RV insulation. The R-value can give you an idea of the insulation the unit offers with a higher number meaning better insulation. Weight, thickness and type of the material as well as overall positioning of the insulation layer determine the R-value. Fiberglass has a better R-value but with more thickness. Styrofoam, on the other hand, is lightweight and offers even better insulation. The latter also doesn’t shift or settle over its lifetime thus adding to the walls’ structural security. Fifth wheel trailers with high density Styrofoam should be your go-to with regards to insulation. Plumbing fixtures in a good-quality fifth wheeler will each have their own shut-off valves and be made with a durable material like brass instead of plastic. Having a one-piece, full-size shower stall and a porcelain toilet instead of a plastic one in your soon-to-be fifth wheeler is more than preferred. 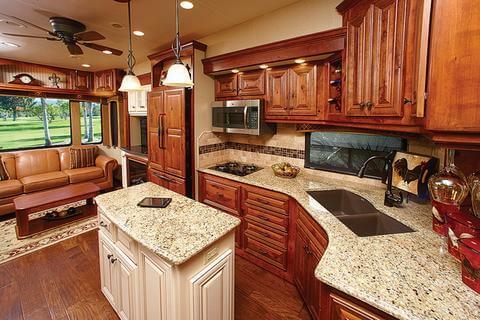 While all-hardwood cabinets are not practical in a fifth wheel trailer due to cost and weight factors, particle boards/plywood with laminated fronts offer the second best option. Remember to do thorough checks on the door hinges, joints and finish to ensure quality is maintained all through. Frameless windows will provide a spotless look on the RV’s exterior, but thermal windows may be of more value as they improve on insulation. Appropriately sized awnings and blinds will be necessary for protecting the trailer’s interior from adverse weather conditions. Ethylene Propylene Diene Monomer (EPDM) and Thermoplastic Polyolefin (TPO) rubber roofs are the most common types of roofing in RVs. Fiberglass options are better but aluminum roofing offers the most durability despite its higher price tag. Sliding systems range from electric & pinion systems, hydraulic, drawer and tip-out mechanisms. They will vary from one manufacturer to the other but none seems to have an edge over the other. Make sure to check on the condition of waterproofing seals on the Slideouts as well as any signs of water damage before purchase. Length of the truck bed greatly influences the ease of towing and cost of setting up a hitch on the bed. A fixed hitch system is more economical for long-bed trucks (8 feet), while a sliding hitch will be more tailored for short-bed trucks. The sliding hitches address clearance issues that are mostly present in short-bed trucks. As a precautionary measure, always stay under the stated payload capacities of the truck. The fifth wheel hitch uses either an above-bed or an under-bed rail system. Most trucks today come with factory prep packages to help you install the rails easily. While this is preferred, ensure that the truck’s prep kit is compatible with the rail system of your fifth wheeler. How you intend to use your towable RV is also something to ruminate on. For fulltime RVing, you will have to look into the overall durability of the said RV and materials used to build it. A four-season unit will also be more ideal to deal with the changing weather/climatic conditions for prolonged RVing. 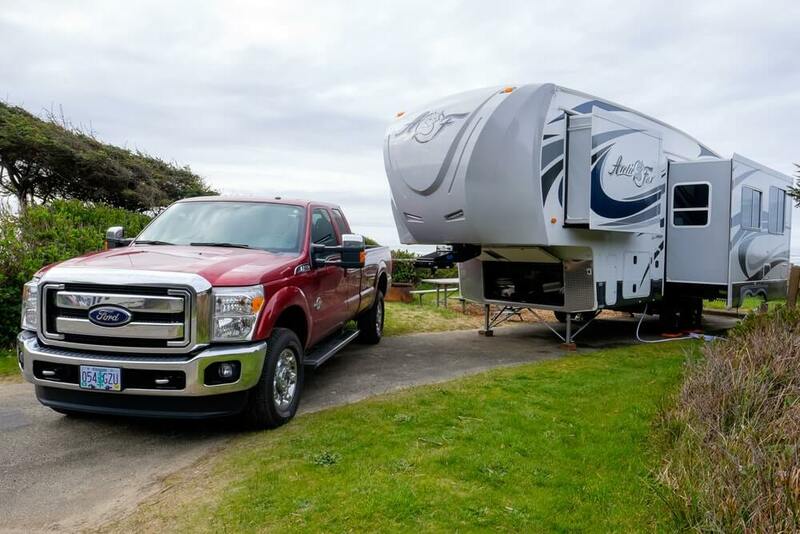 However, it is important to keep in mind that most desirable features of fulltime RVs add considerable weight to the unit thus requiring a heavy-duty truck for towing, the price of which will also be higher. For occasional family vacations and short camping trips, a lightweight fifth wheeler (or even going for a rental) can save you plenty of money. The length of the trailer will determine the overall included amenities and features. Therefore, for a luxurious experience, a longer fifth wheel trailer will do. However, a longer RV may restrict you from accessing most campgrounds and national parks. Towing and finding a parking spot that can fit the RV, also becomes challenging. Weight should never be overlooked when getting these type of RV. The truck’s maximum trailer rating must always be greater than the trailer’s gross vehicle weight rating (GVWR). Fifth wheel trailers have stickers with all the weight specifications for easy calculation. You should never exceed the CCC weight for safety’s sake. RV manufacturers can also avail to you more in-depth data on weight limits. Different states have varying weight, height and length restrictions on trailers so familiarize yourself with all set guidelines before buying a fifth wheel trailer. You may also be required to obtain a specific driver’s license if your fifth wheeler exceeds certain weight limits. The “fifth wheel” hitch allows for easy towing with minimal sways than with travel trailers. The overhang at the front means that fifth wheelers don’t have to extend too long behind the tow vehicle as in travel trailers. Additionally, the hitch firmly roots the trailer to the truck bed which in turn results to lower risks of jackknifing and better maneuverability and driving experience on the road. The hitching system also allows for a slightly extended turning angle (about 90 degrees) ideal for reversing and taking sharp corners. The design provides some extra space on the raised part, which can be used as a bedroom or bathroom. The fifth wheeler is the safest trailer to tow and coupled with an appropriate truck, it allows for huge payloads thanks to the large inbuilt cabinets, overhead lockers and external storage bays. Fifth wheelers have a lot of living and storage space, allowing for a home-like lifestyle. You can house as many as eight guests without any complication. In comparison to travel trailers, fifth wheelers are more spacious and taller allowing for a more open feel and additional headspace. Slide-outs are in heavy use in these types of towable RVs. With the push of a button, you can extend your living or dining room space by up to 3 feet. Some fifth wheel models have as many as four slide-outs, which equals to a lot of space. Additionally, the large space allows for many storage compartments. Be it cabinets, drawers, closets or basement storage bays, enough space is provided for all your camping and household items. You also get larger holding tanks and a plethora of amenities and features. Quality and comfort is enhanced as the RV can include leather recliners, solid-wood cabinetry and air conditioning among other customizations. These types of trailers are easy to attach and detach, which is ideal when you want to make a quick run to a convenience store in your truck. Ball hitches in travel trailers are usually out of sight and will require another person to help with the spotting and attaching. A fifth wheel hitch can be seen in the rear-view mirror thus making the task much easier. 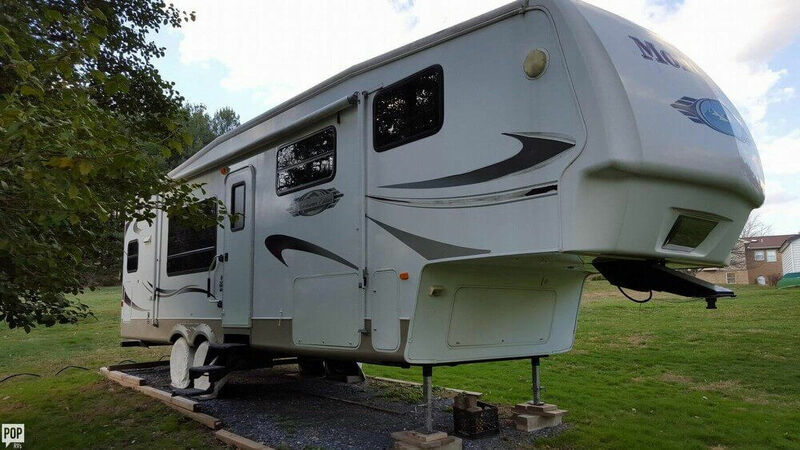 These trailers have automatic leveling stands for quick and easy setup at the campground. Other optional features to improve this include automatic satellite systems, solar panels and large-capacity batteries. 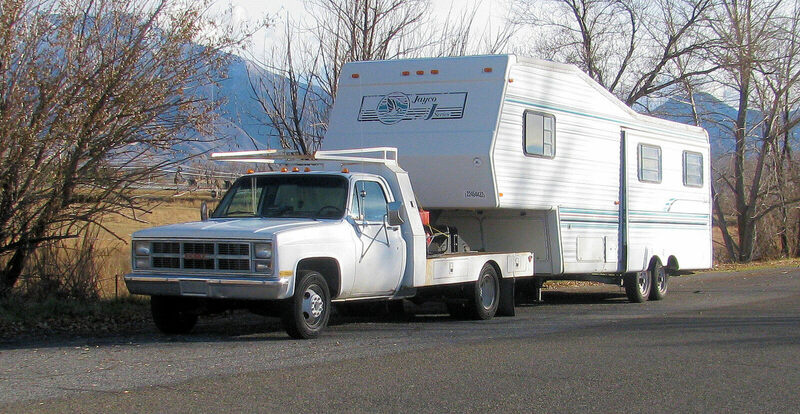 The hitch in fifth wheelers require a specific towing truck, specifically one with an open or flat bed. Additionally, it occupies too much space and may eat up the bedroom space on the raised part. It also renders the bed of the truck unusable for extra storage. However, you can buy a few add-ons to help you utilize the space. Typically, the hitching mechanism consists of the hitch itself, supporting arms and mounting mechanism. All of these must be installed at the center of the truck bed unlike in travel trailers where a standard ball hitch, in the towing truck, is readily available for use. Lastly, towing a boat, dirt bike or an ATV (all-terrain-vehicle) behind the trailer is impractical and a safety risk. Fifth wheelers are the most spacious and luxurious of all towable RVs hence their higher price tag. More amenities and features in a trailer will also mean investing in a larger truck to handle the size and added weight. Your current van, sedan or family coupe will not suffice due to the specific hitch configuration needed for these types of trailer. A towing truck costs between $20,000 and $50,000 which adds to the already higher initial cost of a fifth wheel trailer. Not to mention maintenance and repair expenses for both, RV park/campground fees, insurance premiums and RV storage/covers among other costs. A tracker may also be included for security purposes. Many companies have ventured into the business of fifth wheel trailers since they are relatively easy to build. This has resulted in poor quality and less durable builds. Some companies may underrate the weight specs to make their models desirable to light-duty pickup truck owners, which in itself is a huge safety risk. Price also doesn’t seem to determine the quality of build; for instance, an entry-level model compares closely with a higher-end one. Usually, they feature the same build quality with the only difference being upgrade options, amenities and features. Therefore, it calls for a lot of vigilance and research when buying a fifth wheel trailer. Most if not all fifth wheelers have a bi-level interior design which requires steps in place to access the living room or master bedroom. These steps can be a nuisance to many and thus the uniformity of a motorhome may be a better option to go for. Pickups have over the years increased their towing capacities allowing them to pull heavier and larger fifth wheelers. However, this is not always practical and may lead to loss of control while on the road. It is recommended that you use your best judgment and use an appropriately-sized towing truck without giving into some sales tropes used by dealers. However, some manufacturers do make lightweight fifth wheelers that can be safely towed using a pickup. For boondocking, fifth wheel trailers would not be the right choice due to their height and overall large size. 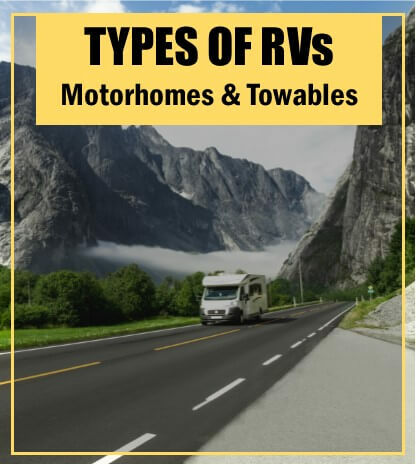 When it boils down to which towable RV to get, fifth wheelers are the most spacious and safest to tow around. You will be spoilt for choice with the many floor plans, amenities and features that come with these trailers. Just don’t forget to factor in the need for a suitable towing truck to handle it all and whether you are ready to deal with a few misgivings they come with.